While on the road in the U.S. West Coast, Jamaican roots rockers Rootz Underground had an epiphany. Inspired by the green living and evvironmental friendliness they saw throughout Oregon, Washington and California, Rootz Underground started an environmental project for themselves, their fans, and eventually for school children in Jamaica and beyond. Rootz ReLeaf originally began as a program to inspire people to plant trees and track the locations of the new transplants, creating a new network of awareness and pro-environmental action. ReLeaf sprouted in 2011 with an official kick-off on Earth Day, April 22, 2012. 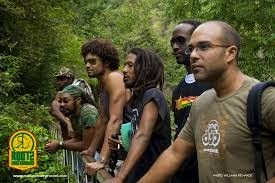 On tour, Rootz Underground was inspired by the brethren and sistren they saw tirelessly working in the realms of nature preservation, food safety and propagation, and environmental health. As the band passed through San Jose, CA, their dear friend Shama Cameron introduced them to a farm called Veggielution, which specializes in community empowerment and involvement, creating community gardens and access to local healthy food. 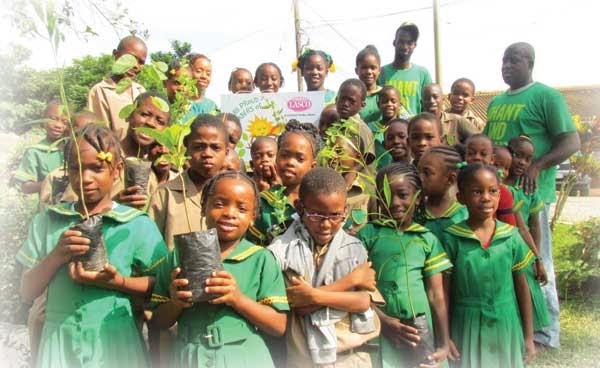 The seed was sown to grow ReLeaf to the next level, bringing environmental awareness and activism to the children and schools with Rootz REAP. ReLeaf Environmental Awareness Program. To help spread the message far and wide, REAP garnered the support of Lasco, a Jamaican company specializing in food production and distribution. As a company, Lasco has a strong reputation for their involvement in sustainable development; community, social and youth empowerment; and education and health - a perfect partner for REAP. In the words of Rootz Underground's lead singer Stephen Newland, "the chairman of the organization, the Honorable Lascelles Chin, has been a visionary, and as such, saw the great potential of the [REAP] initiative, and immediately affixed his signature...Since then, the company as been actively involved in the program, and has placed itself at the helm of REAP corporate support." [REAP] facilitates children's involvement in safe environmental activities [and] incentivizes children in three main environmental areas: tree planting, recycling and energy conservation. We are also actively engaging the community through our Lasco REAP National Schools Competition, and have recently completed our Schools Engagement Tour and [other] special events. As of February 2014, we welcomed the participation of 128 schools and expanded the competition to include all age, preparatory and junior high. REAP has already experienced massive success and growth at home in Jamaica.